WARNER BROS 42892-0. Located in Shibuya, Tokyo, Japan. ABOUT FACE RECORDS. MIDDLE EAST. Madonna//Like A Virgin And Other Big Hits! //JAPAN VERSION. Record Condition is EX(a few surface scratches). Madonna :Causing A Commotion. Disc: EX, Jacket:EX- (minor scratches on front). Obi: EX- (small tear), Insert: EX- (minor aged stain and creases). Made in Japan. Upper limit of the weight of parcel that can be sent. Madonna : Like A Virgin & Other Big Hits. Like A Virgin (Extended Dance Mix). Made in Japan. Lucky Star (Extended Dance Remix). Borderline (Extended Dance Remix). Disc： Excellent. 【Product Details】. Insert : Excellent. Madonna Dress You Up - Ain't No Big Deal record w/obi P-5202 [excellent ] 45RPM. Obi : near mint. Ain't no big deal. Dress you up. Disc : near mint. (mint, near mint, excellent, very good, good). 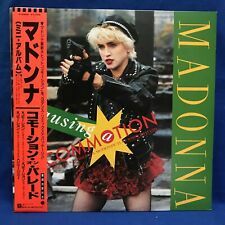 Madonna - Like A Virgin & Other Big Hits '85 EP JAPAN ORG! Includes Obi and insert featuring notes in Japanese and lyrics in both English and Japanese. Genre: Electronic, Pop. A1 Like A Virgin (Extended Dance Mix) 6:07. 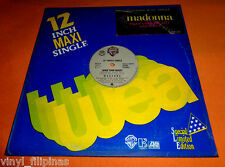 MADONNA KEEP IT TOGETHER MAXI 1990 PROMO ORIGINAL GREAT CONDITION! VG++/VG++!! THIS SALE IS FOR: MADONNA "KEEP IT TOGETHER" VINYL MAXI SINGLE/EP. Rare Remix Versions, Original version from Madonna's "Like A Prayer" Album. SEE BELOW FOR AN EXPLANATION OF MY GRADING SYSTEM. VINYL: VG Vinyl is Very Black, Shiny and Glossy with very few, very light scuffs or paper rubs. 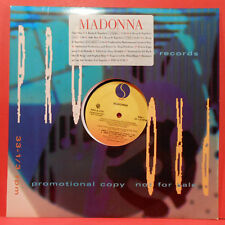 MADONNA Buenos Aires US Advance Promo Only REMIXES 12"
US Advance Promo Only REMIXES 12". Buenos Aires. Rare collectors item find. Sold as is. No returns/refunds. (Limited worldwide release of 8000.). FUNK / SOUL. GLITCH HOP. SIDE A: "Into The Groove (Single Version)" 02 "Angel (Extended Dance Mix)". each addl. BATTLE BREAKS/ACAPELLAS. Label:Sire 25535 WOL. Genre: Pop Disco. Into The Groove. Vinyl: Strong VG Hairlines. C lean them once in a while. Released: 1987. Audio Quality: Strong VG . Format: 12" 33 1/3 rpm EP LP. Madonna Angel- Shaped Picture Disc Collectors Edition Record. Condition is Used. Comes with original plastic covers and hype sticker. Angel (1985) 7” Shaped Picture Disc Limited Edition Deeper And Deeper (1992) 12” Picture Disc Special Edition UK Imports! BLUE VINYL. Everybody (Extended Version). LA ISLA BONITA SUPER MIX. SIRE P-6260. Located in Shibuya, Tokyo, Japan. MIDDLE EAST. NOTHING REALLY MATTERS. Located in Shibuya, Tokyo, Japan. ABOUT FACE RECORDS. MIDDLE EAST. Sheet Music & Song Books. All DVDs and Blu-Ray are UK Region B/2 (PAL) unless otherwise stated. Records advertised as Sealed or Unplayed should be Mint. Our range of Karaoke DVDs contain professional studio recreations. OTTO VON WERNHERR & MADONNA. POLYDOR 13MM 7031. SOUL / FUNK. COSMIC CLIMB. Located in Shibuya, Tokyo, Japan. MIDDLE EAST. 4-6.. 20.00. 2-3. 15.00. QTY------------- COST. Madonna - Material Girl, Angel And Into The Groove '85 EP JAPAN ORG!! B1 Angel (Extended Dance Mix). A2 Into The Groove. A1 Material Girl (Extended Dance Remix). Country: Japan. Made by Warner-Pioneer Corporation, Japan. 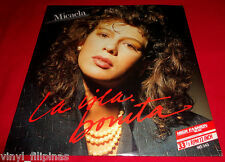 Format: Vinyl, 12", Maxi-Single, 45 RPM. These marks do not affect play. PAPA DON'T PREACH. SIRE P-3603. Located in Shibuya, Tokyo, Japan. MIDDLE EAST. Plain yellow die-cut sleeve. Disc is beautiful NM condition. IF YOU DO NOT WANT YOUR LP SENT AT FULLY DECLARED VALUE, WE WILL SEND IT AT A LOW VALUE BUT THIS IS AT YOUR OWN RISK. SIRE P-5199. MATERIAL GIRL,ANGEL AND INTO THE GROOVE. Located in Shibuya, Tokyo, Japan. The item in the picture is the item you will receive. All records are graded visually and very strict. Countries and regions where underwriting suspension are occurring. It plays at 45 rpm speed. It is on green colored vinyl. It includes rare mixes and is limited to 12,500 pressed. La Isla Bonita (extended remix). Open Your Heart (extended version). Crazy For You. MADONNA / LIKE A VIRGIN & OTHER BIG HITS. Condition;SLEEVE:EX , VINYL:EX , OBI:EX . Vinyl 12" Single or Album. I can accept multiple order. We can also send it via EMS (Fast & Safe! CDs . ). Official 2019 RSD 12" vinyl and a re-issue of the 1986 Japanese 12" 'True Blue - Super Club Mix EP' issued as a limited edition for 'Record Store Day' and pressed on 140 gram Blue vinyl with the original artwork & yellow Sire 'Made in the EU' labels, including the Japanese Obi strip, Lyric insert & featuring 5 tracks - 1.True Blue (The Color Mix) (6.37) 2.Everybody (Dub Version) (9.23) 3.Papa Don't Preach (Extended Version) (5.45) 4.Everybody (Extended Version) (5.56) 5.Live To Tell (Instrumental Version) (5.49) Made in the EU text on the back cover Special release fro Record Store Day 2019 1st time on limited edition Blue Colour Vinyl with RSD & exclusive cover stickers Catalogue #603497854059 / Matrix # 603497854059 (R1-25533 A) In Mint Sealed Condition. Official 2019 RSD 12" vinyl and a re-issue of the 1987 Japanese 12" 'La Isla Bonita - Super Mix EP' issued as a limited edition for 'Record Store Day' and pressed on 140 gram Green vinyl with the original artwork & yellow Sire 'Made in the EU' labels , including the Japanese Obi strip, Lyric insert & featuring 5 tracks 1.La Isla Bonita (Extended Remix) (5.24) 2.Open Your Heart (Extended Version) (10.35) 3.Gambler (3.58) 4.Crazy For You (4.12) 5.La Isla Bonita (Instrumental) (5.21) Special release for independent stores on 13th April 2019 1st time on limited edition Green Colour Vinyl with RSD & Exclusive stickers Catalogue # 603497853533 / Matrix # 603497853533 (R1-25451A) In Mint Sealed Condition. Sheet Music & Song Books. All DVDs and Blu-Ray are UK Region B/2 (PAL) unless otherwise stated. Records advertised as Sealed or Unplayed should be Mint. HAWKEYE TRADING UNIT 46A TONG PARK BAILDON BD17 7QD.